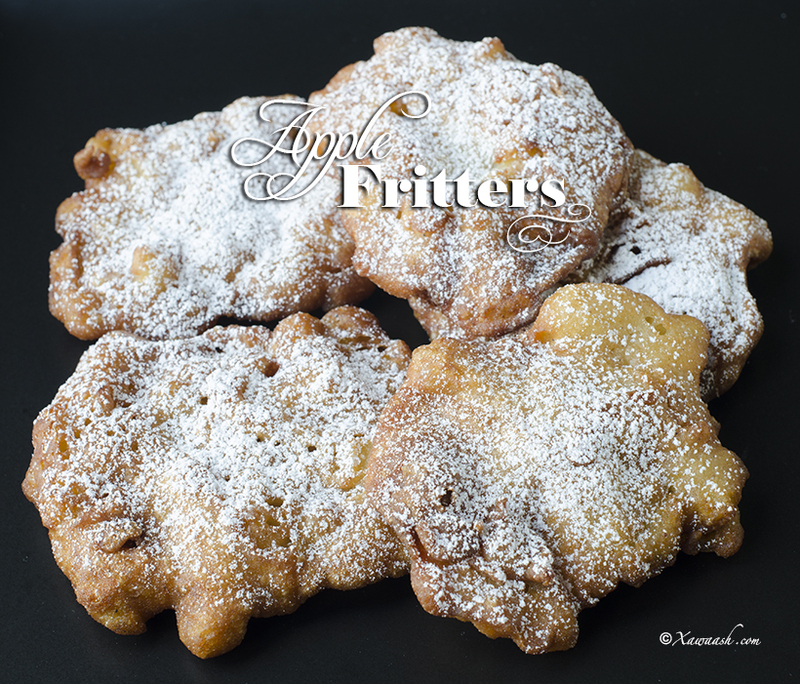 We wanted to post the recipe for apple fritters ever since our visit to the Savour Stratford Perth County Culinary Festival. The festival is held once a year in beautiful Stratford, Ontario, a city alive with art and culture. The culinary festival brings together food lovers, award-winning chefs, local artisan producers and farmers. There are food tastings, cooking classes, food stalls, and music concerts. We saw a big line-up in front of one of the food stalls that was selling apple fritters and we got in line. After a long wait, the two of us ordered half a dozen fritters, thinking they were a lot and that we would bring some home with us. 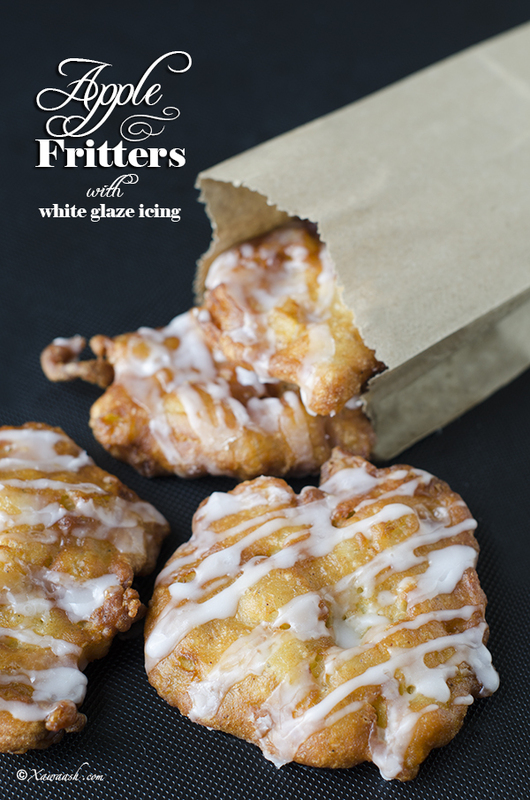 We were handed a small, brown paper bag that contained six tiny fritters. We ate them quickly and licked our fingers. They were unbelievably delicious! Without hesitation, we got back in the line, that was now longer, and after another long wait, we got two dozen fritters to eat and share with our family. That was last September. We were looking forward to the festival this year but it was moved to July and unfortunately for us, it falls on Ramadan. That is why we decided to make our own fritters. Last week, we tested the recipe on family members and everyone liked them. 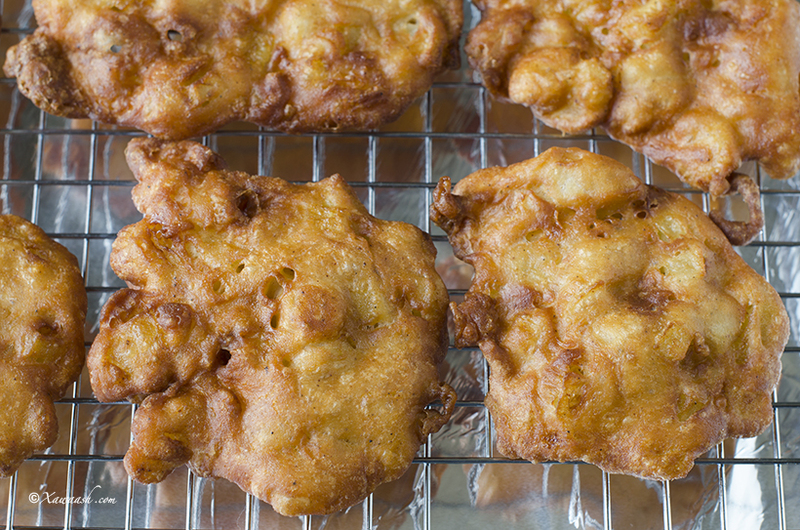 The apples in the fritters we had in Stratford were sliced but we decided to use finely diced apples since our fritters are bigger. 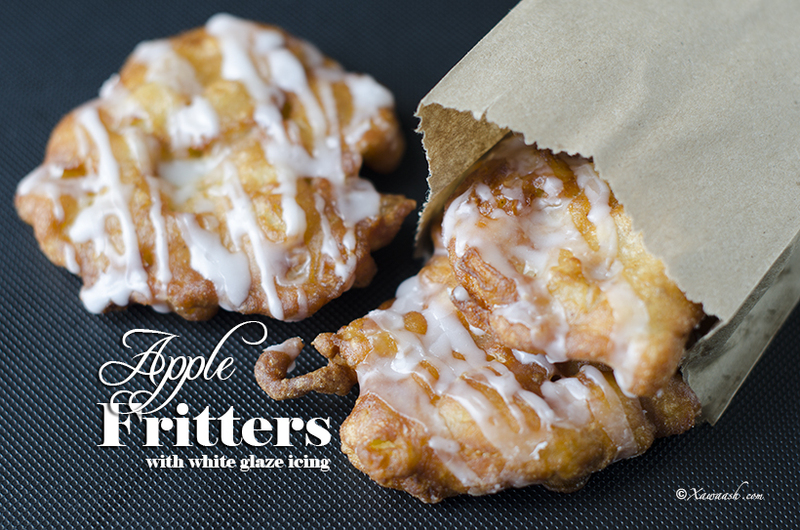 This way, you will get pieces of apple every time you bite into the delicious fritters. 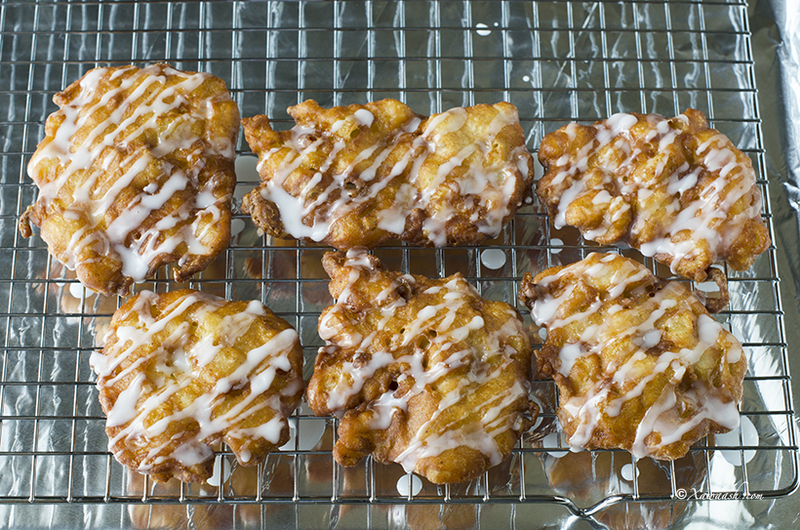 Another change we made was to use glaze icing instead of sprinkling them with powdered sugar. The choice is yours. 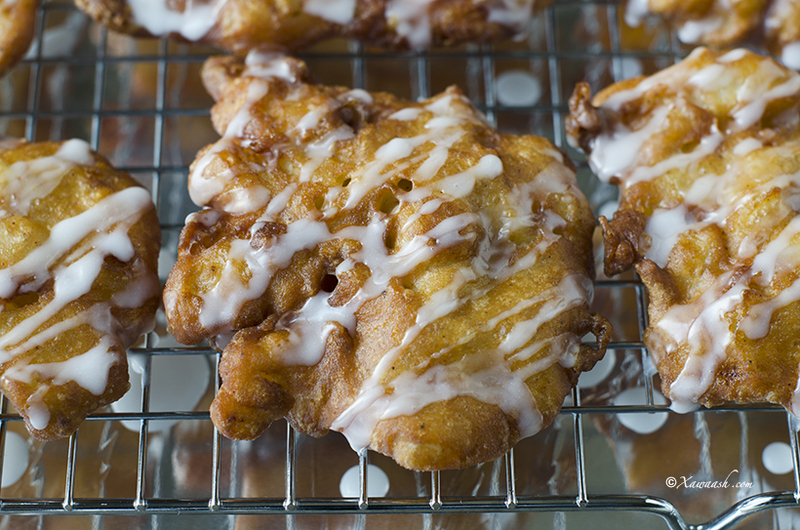 You can have them plain, with powdered sugar, or use the simple glaze icing. 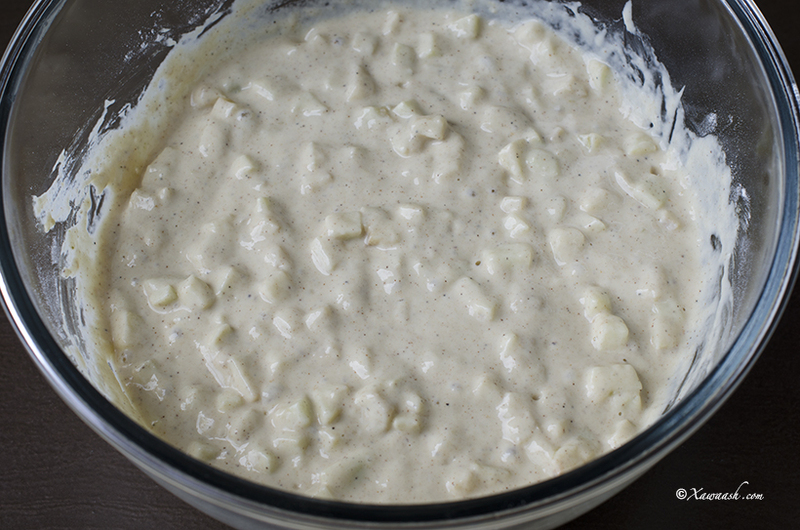 We used Granny Smith apples but you can use any tangy, tart apples. 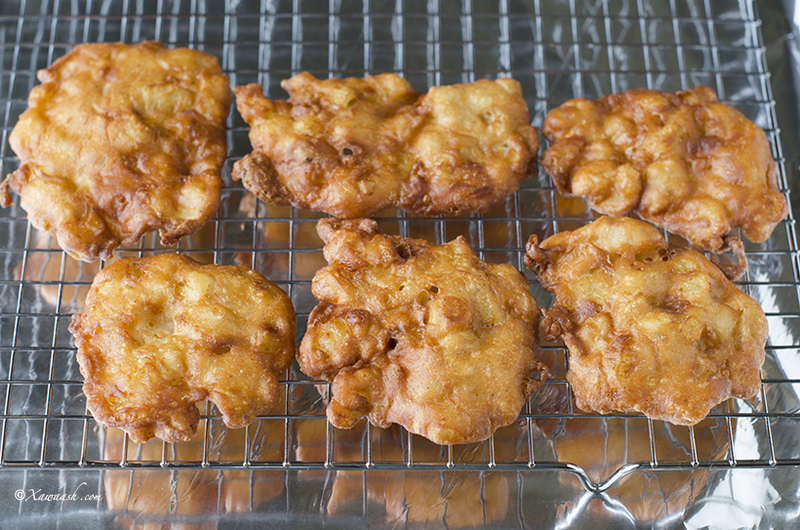 The fritters can also be made with any tangy-tasting fruit such as peaches, pears, strawberries, rhubarbs, etc. 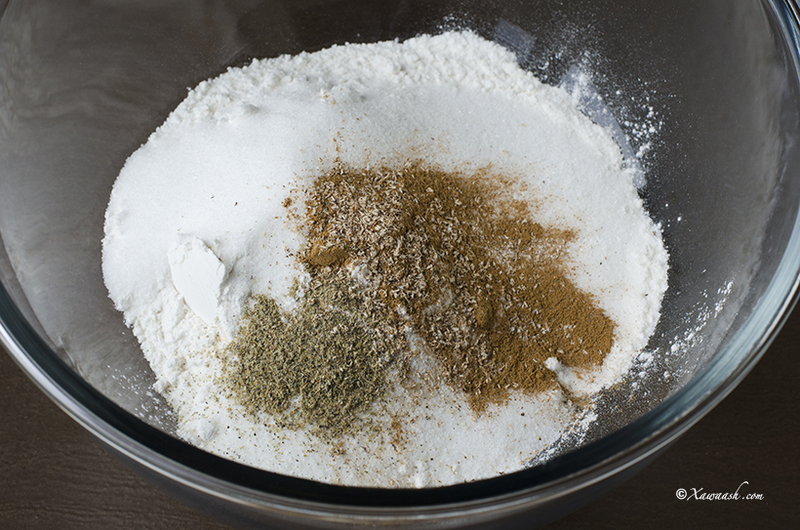 Combine all the dry ingredients in a bowl and whisk well. Add the eggs, yogurt and water and mix well. 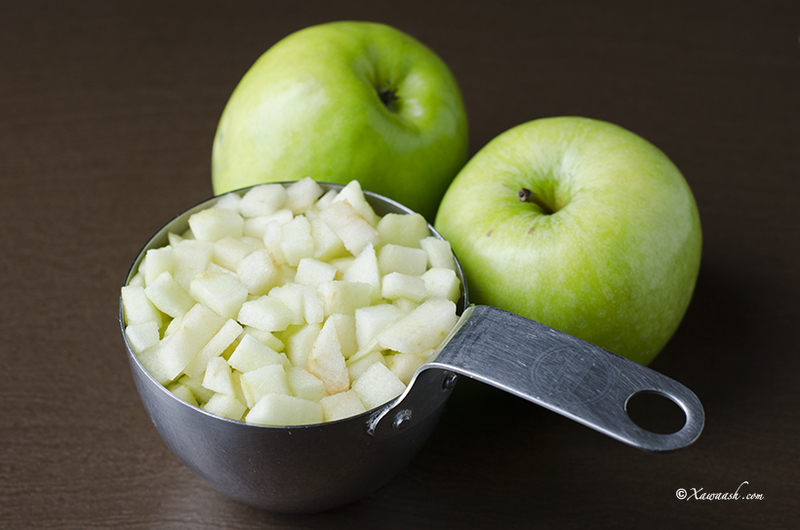 Add the chopped apples and stir. Heat vegetable oil in a skillet set over medium heat. 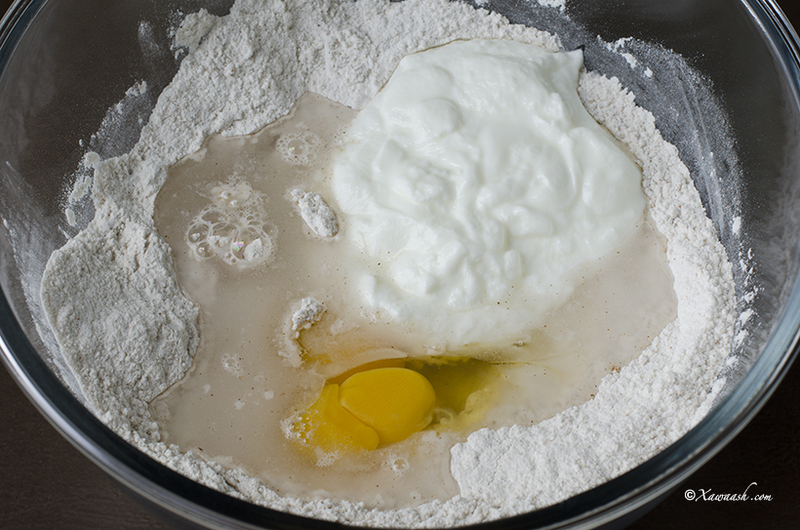 Using a serving spoon, gently drop the dough into the oil in batches. Fry for 3 minutes then flip and fry for another 2 minute or until golden brown. 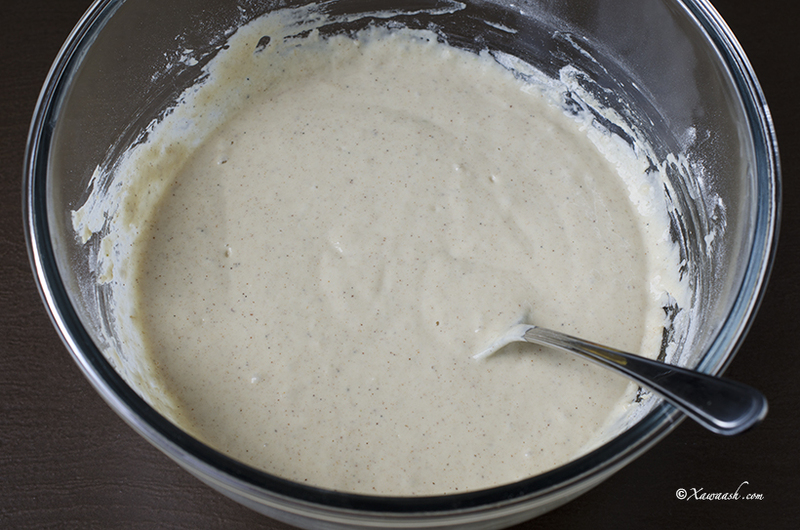 Prepare the icing by mixing the icing sugar with water. 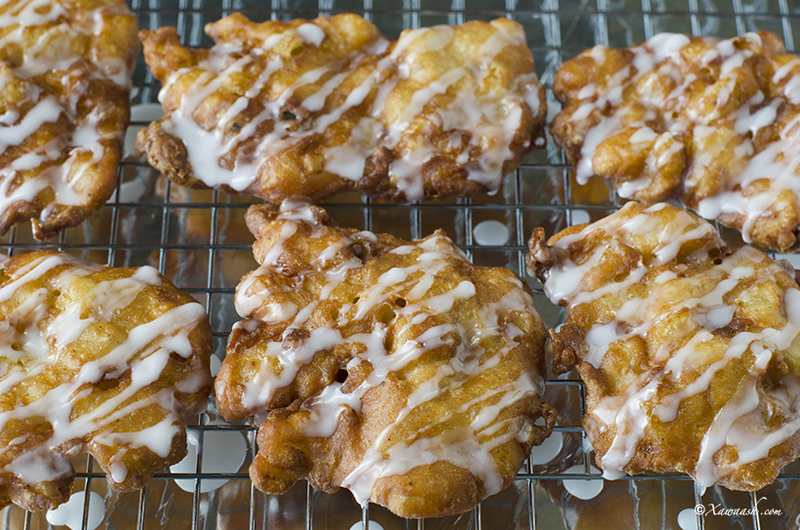 Drizzle the icing over the fritters. Mukawinaadka qalalan isku dar, kaddibna isku qas. Ku dar ukunta, caana fadhiga iyo biyaha. Si fiican u qas. Tufaaxa la jarjaray ku dar, kuna u qas. Saliid caddeey ku shub bir dab dhexdhexaad ah saaran. Qaaddo weyn cajiinka ku soo qaado, kaddibna saliidda kulul cajiinka ku shub. Shiil muddo 3 daqiiqo. Geddi, kaddibna muddo laba daqiiqo shiil ilaa uu burka ka gaduuto. Isku dar sokorta shiidan iyo biyaha, si fiicanna isku qas. Iidaanka sokorta burka la shiilay ku kor shub. 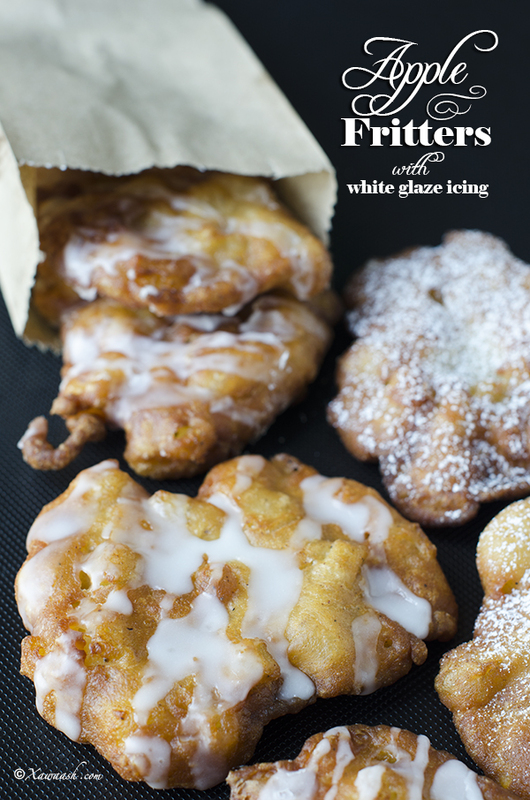 Nous avons prévu de publier cette recette de beignets aux pommes depuis notre visite au festival culinaire Savour Stratford Perth County. Le festival se tient une fois par an dans la belle ville de Stratford, Ontario, une cité de culture et d’art. Le festival culinaire attire les amateurs de gastronomie, les chefs étoilés, les artisans producteurs et fermiers locaux. Au programme, il y a des séances de dégustation, des cours de cuisine, des stands gastronomiques et des concerts. Nous y avons vu une longue file d’attente devant un stand qui vendait des beignets aux pommes et nous avons fait la queue. Après une longue attente, nous avons commandé tous les deux une demie douzaine de beignets, pensant en prendre une grande quantité pour ramener à la maison. A notre surprise, nous avons reçu un petit sac en papier qui contenait six petits beignets. Nous les avons mangé rapidement et nous nous sommes léchés les doigts. Ils étaient incroyablement délicieux! Sans hésitation, nous avons refait la queue, qui était encore plus longue, après encore une longue attente, nous avons acheté deux douzaines de beignets pour les déguster et les partager avec notre famille. Ceci s’est passé en septembre dernier. Nous attendions avec impatience le festival cette année mais il a été déplacé en Juillet et malheureusement pour nous, il tombe pendant le Ramadan. C’est pourquoi nous avons décidé de faire nos propres beignets. La semaine dernière, nous avons testé la recette sur la famille et tout le monde a aimé. Les pommes dans les beignets que nous avons mangé à Stratford, étaient en tranches mais nous avons décidé de détailler les pommes en petits dés car nos beignets sont plus gros. Comme ça, il y a des morceaux de pomme dans chaque bouchée de délicieux beignet. Nous avons fait un autre changement, nous avons remplacé le sucre glace par un glaçage. Vous avez le choix. De les manger nature, saupoudrés de sucre glace, ou recouverts de glaçage. Verser tous les ingrédients secs dans un saladier et fouetter. Ajouter les oeufs, le yaourt, l’eau et bien mélanger. Ajouter les morceaux de pommes et touiller. Faire chauffer l’huile dans une poêle à feu moyen. Avec une cuillère à servir, verser doucement la pâte doucement dans la friture en plusieurs fois. Frire 3 minutes, retourner et frire 2 minutes de plus ou jusqu’à ce que les beignets soient dorés. Préparer le glaçage en mélangeant le sucre glace et l’eau. Verser le glaçage en filet sur les beignets. for guests insha’allah for iftar. We hope everyone will like them. Enjoy! Looks good! Approximately how many does it make? 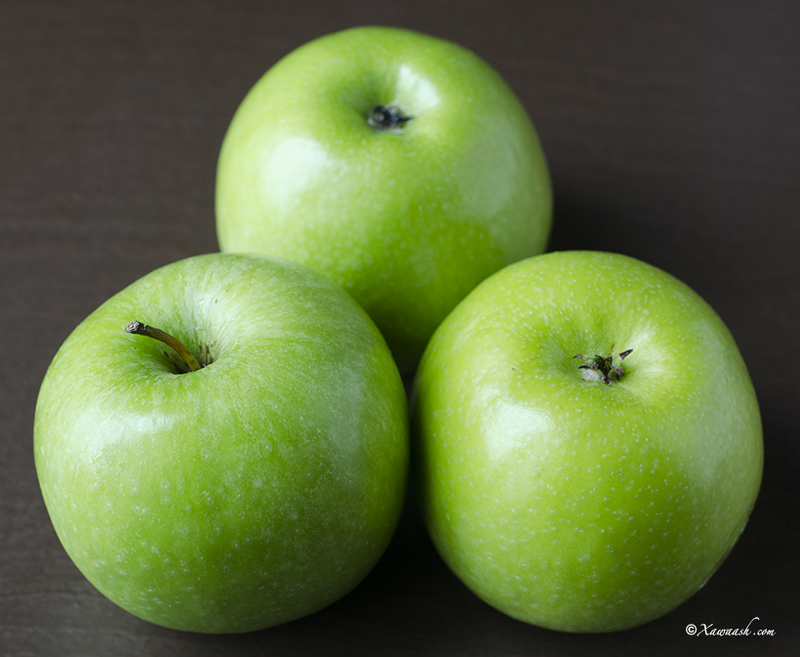 is it mandatory to only use the green apples, Can I use red apples? Aunt Layla and Uncle Abdualhi, mom made this for us tonight. Everyone really enjoyed it. She did however say there was to much oil but otherwise everything else was perfect. Thanks for the recipe!! We are happy to know that everyone liked it. Thank you for letting us know. The oil has to be hot. That is why we tested the oil temperature with a little bit of the batter. asc jzka sister i really loved it before trying what can substitute with the egg in our household we have egg allergy!!! Thank you for your comment and question. You can increase the baking powder to 2 teaspoons. aslamu alekum, i would like to thank you both for taking the time to put all these amazing videos together. you have no idea how much i enjoy your blog. I’m obsess with it. okay my question is can i use a flavoured yogurt? and do you add the icing sugar while hot? Thank you very much for your kind words. We are happy to know that you like the blog. Yes, you can use flavoured yogurt. Wait for them to cool down a bit before adding the icing. Asc walaal. Waxaa ku noo lahay Sweden bahda Xawaash waxaa kor uqaadeen cuntada somalida iyo kuwa kaleba. Jazakallah wax aad iyo aad ubadan baa idinka fa’idey. Ilaahey miisaanka hadiin saaro. Aad iyo aad baa mahasantihiin. Xawaash hanoolaado! Aad iyo aad ayaa ugu mahadsan tahay faallada qiimaha iyo qaayaha leh. Waan ku faraxnay wax badan. Adigana qayr badan Ilaahay ha ku siiyo. 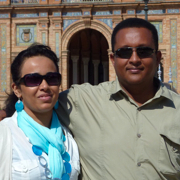 Liiska ayaan ku darnay, hadduu Eebbe idmona waan soo gelin doonnaa.